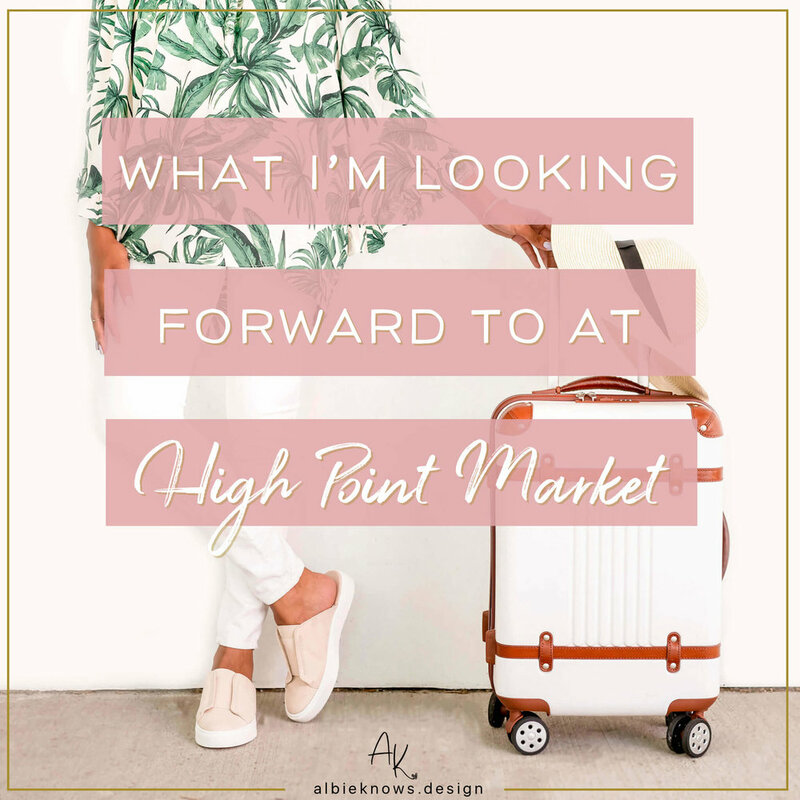 Last Spring, I had the honor and pleasure of being invited to my first ever High Point Market. I went from having no interest in this “fashion week” of the home industry to booking a last minute flight for a 72-hour trip — 48 hours travel & 24 hours actually at High Point! I was invited by The Design Network to speak on their panel talking about my fav thing ever — the business of e-design! Hosted by Surya, I got to sit alongside Kelli Ellis, Shayla Copas, Sandra Funk, Veronica Solomon, Rachel Moriarty, and Dixie Willard, talking to nearly 200 designers all about this thing that, when I started 3 years ago, I didn’t even know what a thing! That was definitely a “pinch me” type of scenario! Despite a trying 2 days of travel in airports across the country — High Point is in North Carolina, in case you were wondering — the entire trip was amaze balls & I was immediately enamored with the whole thing. I knew that I had to be back again! Fast forward a couple of months, during which I launched a second business specifically for e-designers — The E-Design Experience — I am prepping to make my return to High Point Market, and this time for more than a day. I have a GAGGLE of online friends & connections within the interior design industry from all over the country, some of whom I speak to almost daily, yet have never met in real life. Let’s be honest — it’s the nature of the times that we’re in. With social media, it can be really easy to connect with people digitally, and as an online designpreneur, I am perfectly fine with this; but it will be nice to actually breathe the same air as some of my friends & laugh over cocktails. I don’t know about you, but I follow quite a few brands & vendors, and being that High Point is the Mecca of the home furnishings & decor — it’s a city filled with more than eleven million square feet of home décor and furniture showrooms, so I mean c’mon — this is where you’ll meet the who's who of your favs’ fav brands! And I’m not just talking about the voice behind a social media account, which is also pretty dope, but the actual heart that’s behind many of the designs we admire & swoon over from an affordable distance. With hundreds (thousands?) of showrooms to explore, you better bet your bottom dollar I’ll be bumping into the movers & shakers that make this industry amazing. When I likened High Point Market to Fashion Week, I wasn’t being facetious — it happens twice a year in the spring & fall, and it’s 5 days where vendors debut their upcoming collections. Designers & buyers alike are there to get an inside look at upcoming trends and/or build relationships to bring back to their own businesses. There’s a whole lot of networking & don’t even get me started on the parties! Like I said — Fashion Week. With this in mind, I plan to keep my eyes peeled for new trends, trends that have stood the test of time, and trends that are long gone & forgotten. While my own buying habits aren’t dictated by trends & I never recommend anyone to subscribe to them either, keeping my finger on the pulse of the industry is in no way a bad idea, especially when I can share all those goodies with you. Depending on how immersed you are in the industry, there are some names that “ring bells” no matter if you’re a designer or simply a decor enthusiast — American Leather, Ashley Furniture, Bassett, Bernhardt, Four Hands, Loloi Rugs, Modway, Nourison, Phillip Jeffries, Safavieh, Surya, Vanguard, and Worlds Away…just to name a few! But what makes High Point great isn’t just the brands we know & love, instead, it’s discovering new gems that we didn’t know! When I went in Spring, I was physically at market for a whopping 8 hours (give or take) and still managed to be pleasantly surprised by a new discovery (and now favorite) — Alden Parkes! Now they’re on my list of showrooms to definitely (and intentionally) visit in the Fall. Spring market can easily be credited for the birth of The E-Design Experience — after seeing nearly 200 designers want to know more about e-design, I knew this idea couldn’t just live on my Trello board. So it’s surreal that a few short months later, The E-Design Experience will be hosting 2 events during High Point alongside pillars in the design community — a mentor & mingle mixer with Surya & the Black Interior Designers Network, and a private group tour of Furnitureland South, the largest furniture store like ever! These events are a huge milestone for me because I went from never having been to High Point to attending this industry haven as part of an initiative to further e-design to now bringing my OWN e-design events straight to market myself. I feel blessed & excited to be able to travel for doing what I love (not mention this is the only traveling I’ve done since moving) and so I’ll be taking y’all along with me for the days that I’m there! Shop With Me: High Point Market Fall Trends...Now!